Medical practices throughout the US share a common challenge of prescription prior authorization (PA). This is the requirement by a patient’s health plan to approve a prescription before reimbursing. Neurology practices share this challenge. This article provides insights into the scope of the problem, including common reasons for PA denials, how to improve approval rates, and possible solutions that take the burden off the practice staff. Primary among physician practice concerns regarding PAs is the sheer amount of time required of practice staff (and sometimes the physicians themselves) to manage the PA process. In addition to completing an initial PA submission, health plans often require additional information or a resubmission of a second form. This leads to staff trying to contact the health plan directly, often resulting in long hold times and inefficient responsiveness. In fact, the AMA study showed 64% of practices waiting at least 1 business day, and 30% waiting at least 3 business days, for a PA decision from health plans. Although PA submission requirements vary by plan and by specific medication, there are some factors that regularly contribute to whether a PA is denied. The following insights are from Rabia Kabeer, who as PARx Solutions’ Director of Operations and Technical Support Analyst has first-hand, in-depth knowledge of the intricacies of the PA process. Although Rabia refers to our Prior Authorization Support System (PASS), the principles shared regarding the information and documentation that should be included apply whether a practice submits PAs on its own or when using another PA submission service. Plans usually have a set of formulary alternatives that they need the patient to try and fail before they will approve a PA request. It is very important that the provider or their office staff member who is submitting the PA provide information on all alternatives the patient has tried/failed (including samples) on the initial PA submission. We have a list of formulary alternatives based on the product that offices can select when they are creating a PA request in PASS. Offices do not need to type out each alternative the patient has tried but instead can select from the list provided in the PA wizard. Of course, if the alternative is not listed, there is a free-text box that allows the provider to enter in any additional alternatives that the patient may have tried. Most plans require trial dates and the reason for failure for each alternative listed on the PA form. In PASS, when an office selects an alternative the patient has tried and failed, a window pops open that allows the office to enter in the trial dates for that specific alternative. If the patient has a contraindication to an alternative, it is important that office include what the contraindication is, not just simply state that the patient has a contraindication. The upload feature in PASS allows users to attach documentation to the PA request during the submission process. If the office forgets to attach chart notes/supporting documentation during the PA submission process, they can go back to the request and attach the documents afterwards. Some plans require test/lab results (eg, sleep study, EEG) to review the PA request. During the PA submission process in PASS, offices have an option to include information on any diagnostic testing. Plans require not only the name of the test, but also the results. Providing just the name of the test is often not enough for plans to make a favorable decision on that PA.
At times, offices submit the PA request under the patient’s Medical or Medicare supplemental plan, which does not handle PA review for medications. Other times, the insurance information that is provided on the initial PA submission has expired. If the office has a copy of the patient’s insurance card, they should provide the “RX” insurance information from that card under the Prescription Plan Name and Prescription Plan Member ID fields in PASS. Providing the pharmacy information when entering the PA request is helpful in situations when the insurance information is incorrect or the office is unsure what insurance the patient has for pharmacy benefits. A full-service PA provider will call the pharmacy to verify the correct insurance and submit to plan. Pharmacies usually send a fax with the PA rejection and insurance information to the offices—the ID number and name of the plan from that fax is what a PA service would need to submit the PA request to the correct insurance to avoid processing delays. Some plans require that a patient meet more than one criteria (eg, must be an approved diagnosis based on plan’s guidelines, alternatives must be tried and failed, testing results should be in the approved range). In PASS, we have some specific criteria statements listed based on the product that allows offices to select any that apply to their patient. Some plans also required the “severity” of the diagnosis as one of the criteria that need to be met. For example: If an office lists restless legs syndrome (RLS) as the diagnosis, the plan will need to know if it was moderate-to-severe RLS. In PASS, we have added severities to some of the prepopulated diagnosis to assist offices in selecting the most appropriate one that applies to their patient. 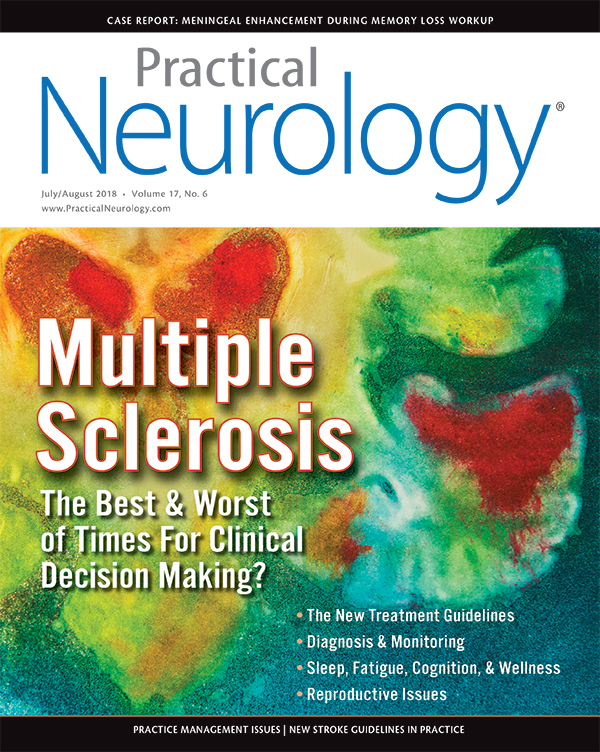 Neurology practices today have a range of options when it comes to managing the ever-increasing number of prescription PAs. As the statistics provided earlier demonstrate, the go-it-alone approach, which places the entirety of the PA submission process burden on practice staff, presents a significant barrier to effective practice management and even to patient care. Another option is to use a form-based third-party service to find and complete the correct form. This method does eliminate the time required by staff to search for the correct forms and simplifies the process of filling out the forms. However, this does not remove the significant burden of interaction with the managed care plan from practice staff (remember those processing times?). 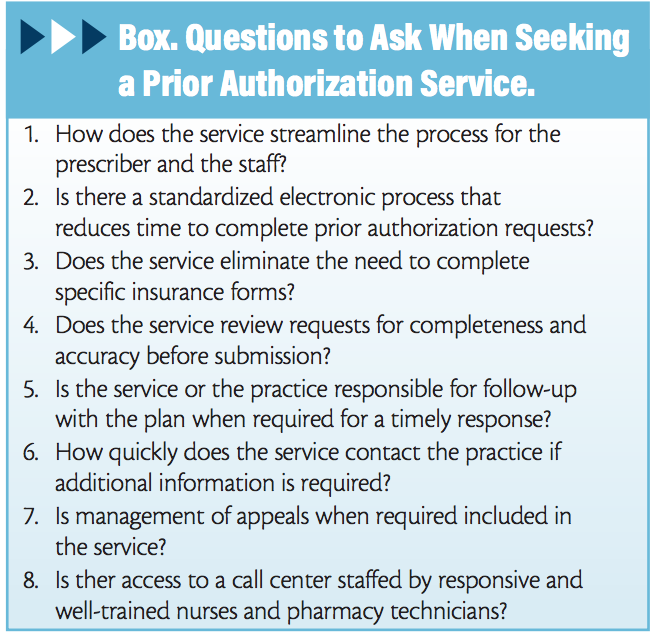 When looking for a PA provider (Box), practices should seek out a service that streamlines the process for the prescriber, provides a standard electronic PA process that eliminates the need to complete specific insurance forms, reviews PA requests for completeness and accuracy prior to submission, follows up with the plan for a timely response, contacts the prescriber when additional information is required, manages appeals if required, and offers access to a call center staffed by responsive and well-trained nurses and pharmacy technicians. Ultimately, using the right PA provider for your specific practice needs means higher quality submissions, leading to more approvals, which in turn means improved patient care and better workflow management. For additional insights into meeting the prior authorization challenge and more, visit www.parxsolutions.com and follow PARx on LinkedIn.